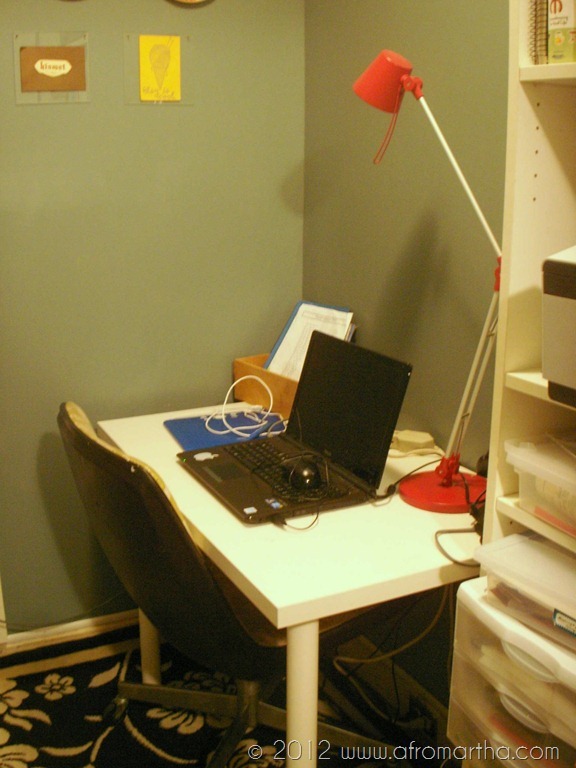 I had originally wanted to paint The Office a swoon-worthy dark gray, as I’ve pinned and houzzed. La Princessa of course thought this was such a boring choice. At the ripe age of 11, she considers herself the authority on all things stylish and Teal, so she doesn’t quite get the finer points of neutral palettes just yet. I did end up painting a teal-adjacent color by complete accident though. As I said in the previous post, I have been without my wheels, leaving me with no way to make gratuitous trips to the home improvement store. I had several cans of paint hanging around in the basement, so I thought I’d get creative and mix my own paint. Let me just say up front that I did pass my color theory class in college but color still thoroughly confounds me. I still get my tertiary and quarternary colors mixed up with my hues, tints and bases. Somehow, I mixed up a green with a lot of yellow in it, with a very vivid blue, and somehow came up with this gorgeous color that I wasn’t so sure about at first, but now absolutely love. May I present to you, my new office space! Here is my 5cent tour as the room currently is. I am still putting on the finishing touches. The glamour shots come later, after I solve the mess o’wire problems. Immediately inside the door: This Billy has been with me since our Norfolk VA days before IKEA decided to change its dimensions. I have since replaced the cardboard backing with a much sturdier plywood. I prettied up the inside of the back with some wallpaper I found here for $15. 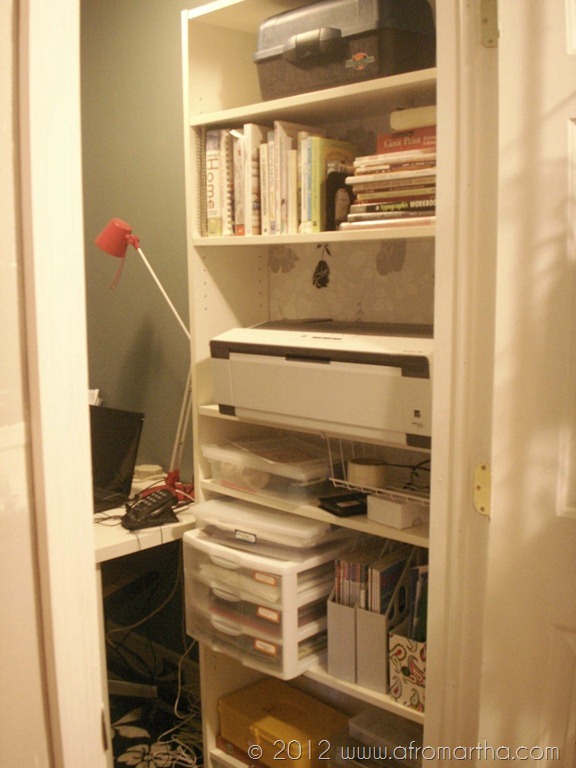 My favorite part of the bookshelf is that it holds a lot of my supplies very nicely, including my behemoth wide format printer. I cut a 2” hole in the back of the shelf to accommodate wires. I even managed to fit in some speakers so I can listen to pandora or Ira Glass (he’s my nerd crush) while working. Next to the bookshelf, my desk. Still to be done: Lots of wires to corral. The chair is also due for another cover, and possibly a repainting? I need a pinboard in front of the desk so I can look at pretty pictures and plot my next project while working at my job…hey, I’m all about multitasking! I have a small project with some christmas lights as seen here in the works. I’m also looking for a nice pendant light or chandelier to replace the ugly utilitarian one above. Art on the walls! 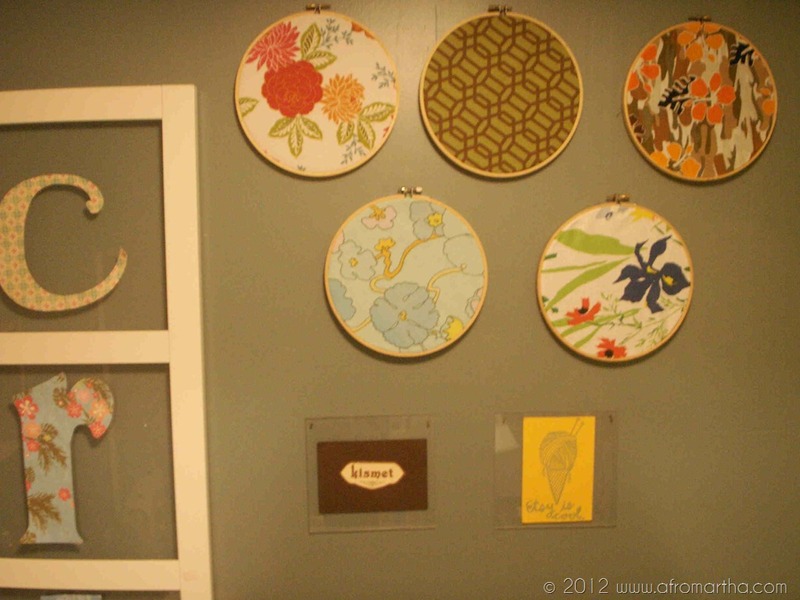 I finally have a place to place my embroidery hoop art. 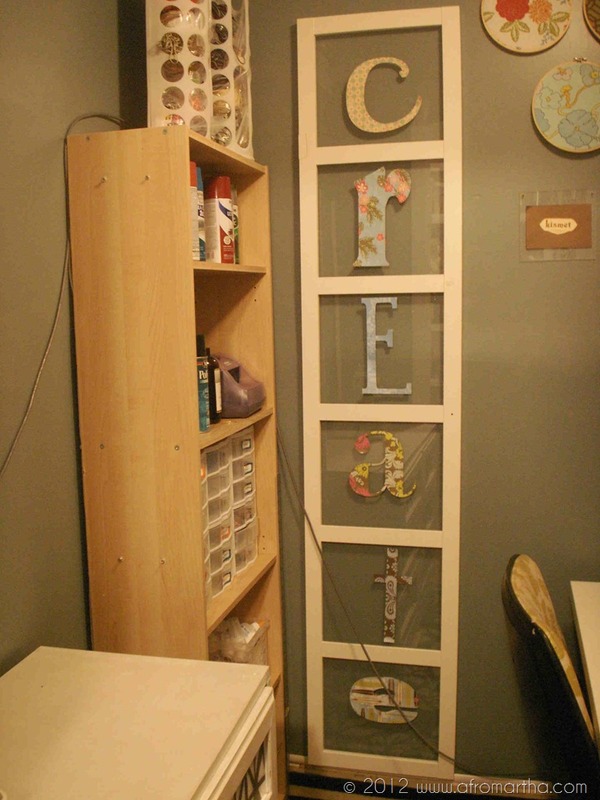 My “Create” glass door art also found a home. If you remember from previous posts, this was originally designed to be hung horizontally. Alas, when I tried to do the same in this tiny office space, I found that the piece was about a half inch too long for the length of the room. So I re-oriented and hung it vertically. It still works, I think. 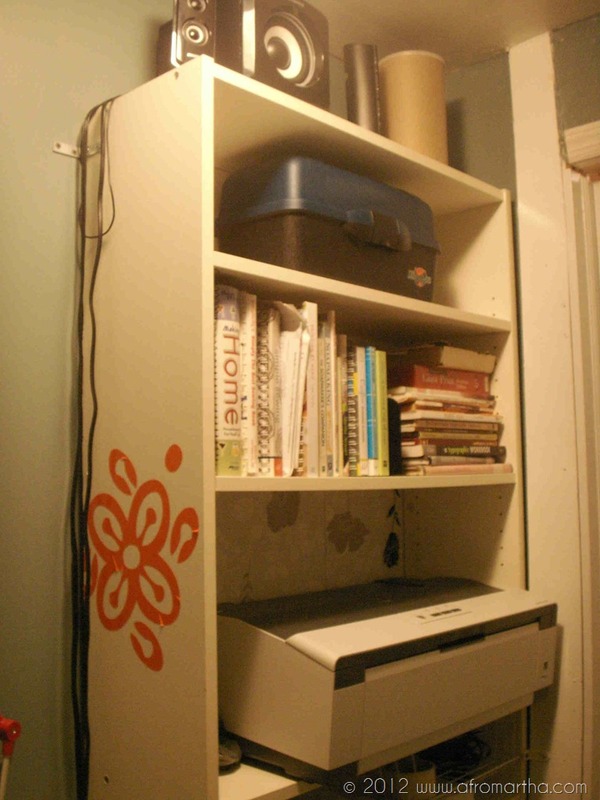 The second (smaller) bookshelf provides additional storage. Ugh, again the wires!That would be the ethernet wire needed for the internet connection for my job snaking its way through the picture. The wire traveled from the family room next door because I did not want to drill one more hole through the walls. Side note: The internet connection is the single reason I started this whole project. For my job I have to have a hard-wired (not wireless) connection, a hardwired phone and a quiet room with a door. Our modem is in the family room, which is the main family hangout. My work hours fall right into after-school time which means noisy background. My choices were to either do this project, or work out of my bedroom, which is on the other end of the house from the internet and phone on the second floor. Running a long cord was out of the question due to the distance and location of the bedroom. I could have also chosen to pay another $55 per month for a second internet connection in my bedroom, but that made no financial sense to me. I also don’t like the idea of a working bedroom. Besides, it would have been less fun to take the easy way out. Henceforth, a new office it is! 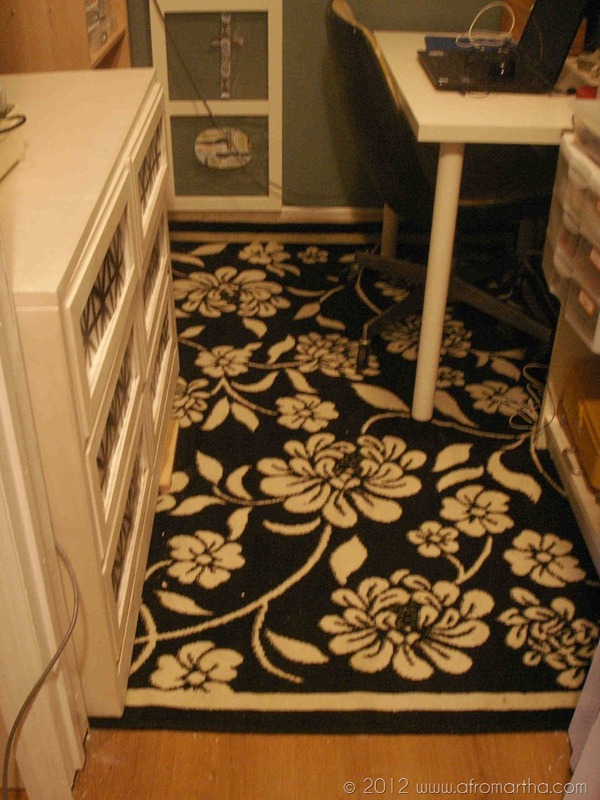 Anywhoo, I managed to also fit a rug into the space. The restyled dresser, remember that? (I have another restyle of the fronts in the works, involving the wallpaper I used on the bookshelf. 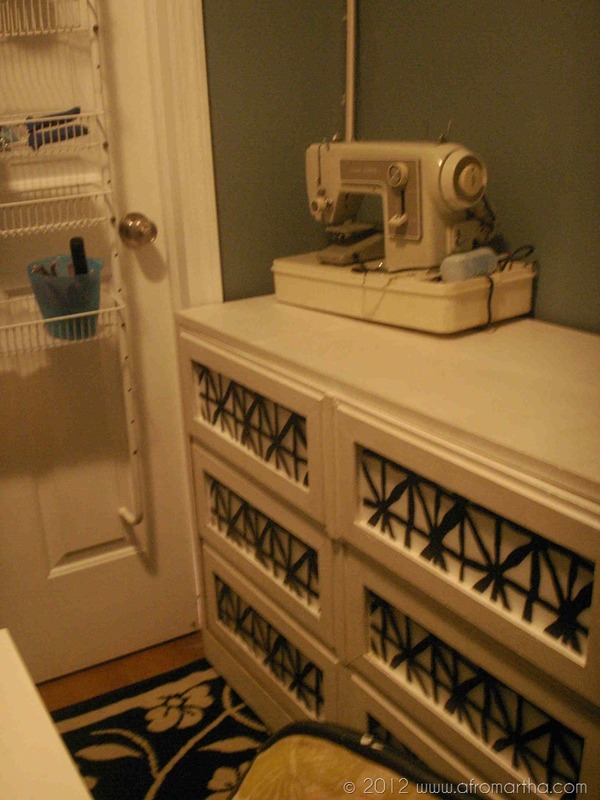 Stay tuned) The dresser provides much needed storage and the surface also holds my beloved vintage sewing machine. I have a thing for old sewing machines, especially the really heavy ones with metal gears inside. I feel about them the same way people feel when looking at pets at the pound. I always find myself gazing lovingly at them when I’m at the thrift store, knowing that I dare not bring another one home. I scored this one for about $12. It came with all the important parts and sews like a dream. How about that doorway! I even put up molding! 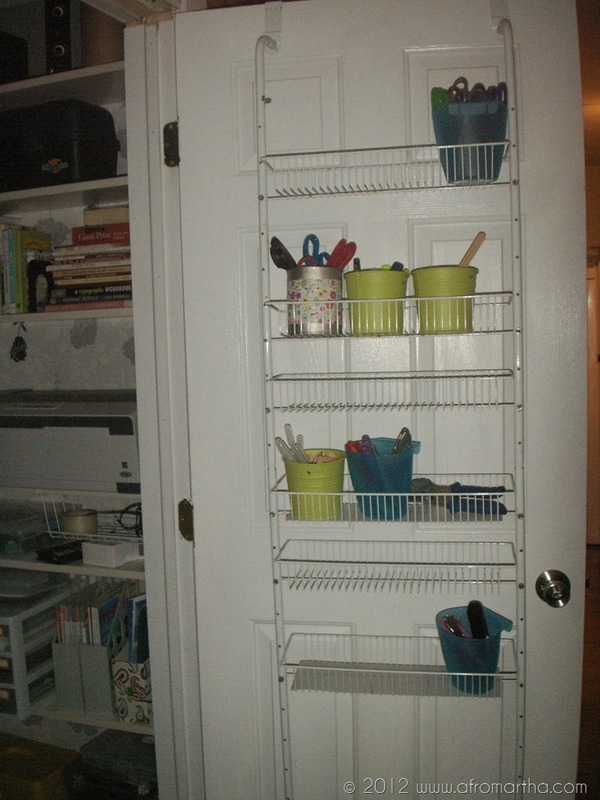 Breakdown: I made use of things I already had on hand, so the décor didn’t cost anything new. I used wallpaper I bought for another project for $15. So there ya have it. A quick tour of my freshly re-built but still a work in progress office/craft space. I will post more pictures as I get things more streamlined and decorated. thank you so much Karen. It was so fun building this. 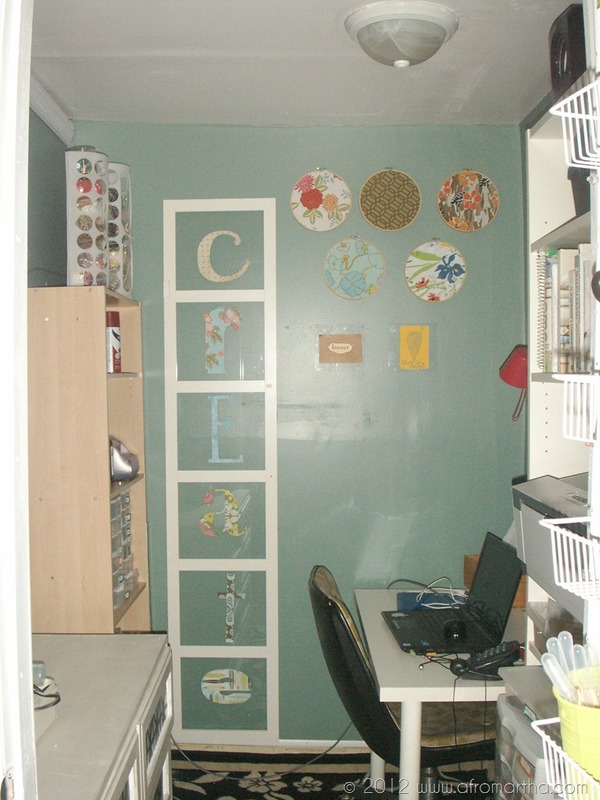 I would love for you to come and decorate/organize our office. It’s a total mess, and I love what you did to your office!